Expires Feb 28st 2015, Not valid with any other offer. Reservation required. Subject to availability. Subject to weather conditions. Must be 13 or older and more than 5’ tall. All drivers must have a valid ID. Must sign waiver. All drivers under 18 must have a signed legal guardian consent form. Race your friends side-by-side, bumper-to-bumper around the oval track. Hitting speeds up to 65 mph, sitting just one inch off the ground, gives you the speed sensation of going 100 mph+. Who will make the fastest lap time the NASCAR sanctioned track. Each racer gets classroom instruction, three 10-lap racing sessions, and racing gear (including a head sock). Central Texas Speed way is located in Kyle, Texas. 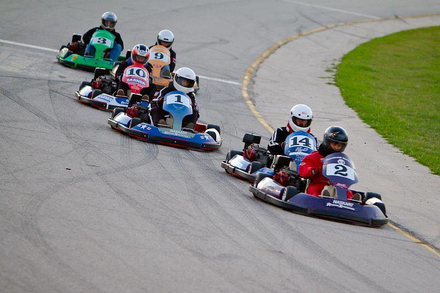 CTS is a one-of-a-kind concert venue, Go-Kart Rental, Stock Car Race Track located on a 39-acre facility. With a 3/8 mile D-shaped asphalt oval Race Track CTS is an attractive spot for Birthday Parties, Car Shows, Banquets, or just a spot to hang out at popular The Car Bar.